Not much information is found in the annals of The Theosophical Society regarding Theosophy in China, save a brief statement in A Short History of The Theosophical Society by Mrs. Josephine Ransom in the Year 1922. In the The Golden Book of The Theosophical Society by C. Jinarājadāsa, there was a picture in Fig. 204 with the caption “Dr. 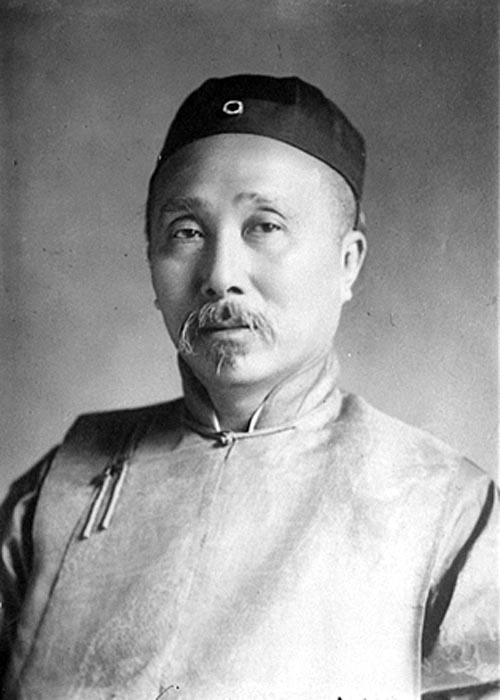 Wu Ting Fang, Author of the first Chinese Manual on Theosophy”. But who was Dr. Wu Ting Fang? No further information was given in theosophical publications regarding this Chinese pioneer of Theosophy. Though a distinguished name in China’s modern history, few realize the significance of this name or the extent of his greatness. Wikipedia describes him as "a Chinese diplomat and politician who served as Minister of Foreign Affairs and briefly as Acting Premier during the early years of the Republic of China; a lawyer and a calligrapher". The Chinese edition of Wikipedia and the Chinese Baidu Encyclopedia give considerably more information on the illustrious background of Dr. Wu Ting Fang. What was not known or not stated was the fact that Dr. Wu was veritably the Father of Theosophy in China. Wu Ting Fang (伍廷芳) was reportedly born on 30 July 1842, interestingly, in Singapore, which was then known as the Straits Settlements. However, at 3 years of age, he was taken by his father back to China where a greater destiny awaited him. He had his early education in Hong Kong. In 1874 he went on to study Law in England at University College London and was called to the bar at Lincoln’s Inn in 1876. Wu Ting Fang became the first ethnic Chinese barrister in history. In 1877 he had the distinction of being the first Chinese to obtain a Doctorate in Law, LL. D. It is interesting to note that at the time when The Theosophical Society was founded in New York with its attendant publicity in London, Dr. Wu was in fact living in England. However, it is not known if he had any contact with early members of the Theosophical Society. After being called to the bar in England, he returned to Hong Kong in 1877 to practise law. Dr. Wu Ting Fang became the first ethnic Chinese Unofficial member of the Legislative Council of Hong Kong when he was appointed by Great Britain in 1880, a position he served until 1882. Dr. Wu was appointed by the Emperor Guangxu and served under the Qing Dynasty as Minister to the United States, Spain and Peru from 1896 to 1902. He returned to the United States to serve as the Chinese Minister for the United States, Mexico, Peru and Cuba from 1907 to 1909. During this time he became friends with President Theodore "Teddy" Roosevelt and also met with the scientist and inventor, Thomas Edison. In March 1910, Dr. Wu left the United States for Europe, Singapore and Hong Kong, enroute to Beijing. "Such a race should certainly be very interesting to study. During my two missions to America where I resided nearly eight years, repeated requests were made that I should write my observations and impressions of America. I did not feel justified in doing so for several reasons: first, I could not find time for such a task amidst my official duties; secondly, although I had been travelling through many sections of the country, and had come in contact officially and socially with many classes of people, still there might be some features of the country and some traits of the people which had escaped my attention; and thirdly, though I had seen much in America to arouse my admiration, I felt that here and there, there was room for improvement, and to be compelled to criticize people who had been generous, courteous, and kind was something I did not wish to do. In answer to my scruples I was told that I was not expected to write about America in a partial or unfair manner, but to state impressions of the land just as I had found it. A lady friend, for whose opinion I have the highest respect, said in effect, “We want you to write about our country and to speak of our people in an impartial and candid way; we do not want you to bestow praise where it is undeserved; and when you find anything deserving of criticism or condemnation you should not hesitate to mention it, for we like our faults to be pointed out that we may reform.” I admit the soundness of my friend’s argument. It shows the broad‐mindedness and magnanimity of the American people. In writing the following pages I have uniformly followed the principles laid down by my American lady friend. I have not scrupled to frankly and freely express my views, but I hope not in any carping spirit; and I trust American readers will forgive me if they find some opinions they cannot endorse. I assure them they were not formed hastily or unkindly. Indeed, I should not be a sincere friend were I to picture their country as a perfect paradise, or were I to gloss over what seem to me to be their defects." This delectable book is witty, humorous, if sometimes satirical, but written with great humility. It was written in 1914 when Dr. Wu Ting Fang had taken up important portfolios in the new Republic of China. Dr. Wu supported the Xinhai Revolution and negotiated on the revolutionaries’ behalf in Shanghai. He served briefly in early 1912 as Minister of Justice for the Nanjing Provisional Government, where he argued strongly for an independent judiciary, based on his experience studying law and travelling overseas. After this brief posting, Dr. Wu became Minister of Foreign Affairs for the ROC. 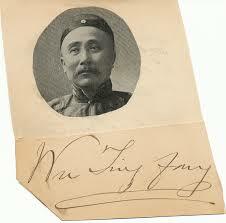 He served briefly in 1917 as Acting Premier of the Republic of China. Dr. Wu joined Dr. Sun Yat‐sen’s Constitutional Protection Movement and became a member of its governing committee. He advised Dr. Sun against becoming the “extraordinary president” but stuck with Dr. Sun after the election. He then served as Dr. Sun’s foreign minister and as acting president when Dr. Sun was absent. He was the Minister of Foreign Affairs from September 1917 to June 1922 and also concurrently as the Minister of Finance from May 1921 to June 1922. He died shortly after Chen Jiongming rebelled against Dr. Sun. Every Thursday Dr. Wu would invite Chinese and Western members to get together at his house to study the true teachings of the various religions, the deep mystery and secrets of heaven and earth (Nature), man’s constitution, etc., in short, Theosophy. According to his followers, whenever he had any leisure after his official duties, Dr. Wu would enthusiastically talk to the Chinese and Western members on Theosophy and occult science and teachings. Evidently, Dr. Wu gave public talks on theosophy long before the first Chinese Lodge was officially chartered. It was reported in the press that on 12 March 1916 Dr. Wu, in his capacity as a Theosophist, was invited by the Shanghai Shangxian Tang (上海尚賢堂 The International Institute of China) to give a talk on "The Relationship Between the Soul and the Body" to an audience of hundreds of people. In June 1921, Dr. Wu Ting Fang translated and published Information for Enquirers (證道學 指南) by Annie Besant. In July 1921, he wrote and published Outline of Theosophy (證道學 會要旨). In the latter publication he gave the reasons with an insightful explanation of the choice of the final name Zhengdaoxue (證道學). On 14 February 1922, Dr. Wu published Elementary Lessons on Karma (因果淺義) which he translated from Annie Besant’s writing. The latter was published four months before his death on 23 June 1922. On 8 March 1923, the Shenjiang Theosophical Society Sun Lodge (申江證道學會太陽會 所) posthumously published Dr Wu Ting Fang’s Dialogues On Theosophy (伍廷芳證道學説). These dialogues were recorded answers by Dr. Wu to questions on Theosophy. In the Preface to this book, tribute was paid to Dr. Wu Ting Fang “as a great sage of the Republic of China who led a life with careful words and deeds, and who did not seek luxury. Everything he did was based on morality as the yardstick.” This book was published together with a compilation of the three other works of Dr. Wu, viz. Outline of Theosophy, Elementary Lessons on Karma and Information for Enquirers. This compilation of Dr. Wu’s works on Theosophy can be found in the archives of the National Library of China although the last two titles appear to be missing. Dr. Wu Ting Fang lived in the era of the founding of The Theosophical Society and the first half a century of its existence. He was a contemporary of the early leaders of the Society. It is not known whether he has ever met any of them but evidently he had great admiration for the leaders such as Annie Besant who incidentally was five years younger than Dr. Wu. In America Through the Spectacles of an Oriental Diplomat, published in 1914, he referred to Annie Besant more than once. "The immigration laws in force in Australia are, I am informed, even more strict and more severe than those in the United States. They amount to almost total prohibition; for they are directed not only against Chinese laborers but are so operated that the Chinese merchant and student are also practically refused admission. In the course of a lecture delivered in England by Mrs. Annie Besant in 1912 on ‘The citizenship of colored races in the British Empire’, while condemning the race prejudices of her own people, she brought out a fact which will be interesting to my readers, especially to the Australians. She says, ‘In Australia a very curious change is taking place. Color has very much deepened in that clime, and the Australian has become very yellow; so that it becomes a problem whether, after a time, the people would be allowed to live in their own country. The white people are far more colored than are some Indians.’ In the face of this plain fact is it not time, for their own sake, that the Australians should drop their cry against yellow people and induce their Parliament to abolish, or at least to modify, their immigration laws with regard to the yellow race?" "As an ardent believer in the natural, healthy and compassionate life I was interested to find in the Encyclopaedia Britannica how frequently vegetarians have been winners in athletic sports. They won the Berlin to Dresden walking match, a distance of 125 miles, the Carwardine Cup (100 miles) and Dibble Shield (6 hours) cycling races (1901‐02), the amateur championship of England in tennis (four successive years up to 1902) and racquets (1902), the cycling championship of India (three years), half‐mile running championship of Scotland (1896), world’s amateur cycle records for all times from four hours to thirteen hours (1902), 100 miles championship Yorkshire Road Club (1899, 1901), tennis gold medal (five times). I have not access to later statistics on this subject but I know that it is the reverse of truth to say, as Professor Gautier, of the Sarbonne, a Catholic foundation in Paris, recently said, that vegetarians ‘suffer from lack of energy and weakened will power.’ The above facts disprove it, and as against Prof. Gautier, I quote Dr. J. H. Kellogg, the eminent physician and Superintendent of Battle Creek Sanitarium in Michigan, U.S.A., who has been a strict vegetarian for many years and who, though over sixty years of age, is as strong and vigorous as a man of forty; he told me that he worked sixteen hours daily without the least fatigue. Mrs. Annie Besant, President of the Theosophical Society, is another example. I am credibly informed that she has been a vegetarian for at least thirty‐five years and that it is doubtful if any flesh‐eater who is sixty‐five can equal her in energy. Whatever else vegetarians may lack they are not lacking in powers of endurance." Here again, Annie Besant is mentioned. It was indeed a loss for the Theosophical Society that Dr. Wu passed away only three years after he formed the first Chinese lodge. Being a Chinese scholar highly proficient in both the English and Chinese languages and in a position of power and influence, he was pre‐ eminently qualified to translate Theosophical literature to spread Theosophy throughout Greater China. Then again, he was already 80 years old when he died. However, his legacy was preserved and the name he chose for The Theosophical Society was kept active until the Second World War. "Mr. A. F. Knudsen was appointed Presidential Agent for East Asia. He and his wife made Shanghai their centre— ‘a better place than Hong Kong to contact the real China’. An appreciable amount of Theosophical literature had already been translated into Chinese." Indeed, Mr. Knudsen presented one of these translated books, Theosophy (證道學) in Chinese to Adyar on 21 January 1938. It is not known when the book was first published. The translator’s name is given in Chinese as Yuanhujinhuilian (鴛湖金慧蓮先生) which appears to be a transliteration of a Western name. This is a rather comprehensive book and the closest to a Chinese theosophical manual. Two versions of At the Feet of the Master were found with the Chinese title Shixun (師訓). One of them has a Preface by Mr. Knudsen dated 17 April 1937. However, the translator was not named. The other version is undated but evidently an older version translated by Lin Haohua (三水林浩華). "On his return journey he spent a longer time in Shanghai, where he gave one public lecture and addressed the Lodge several times, and gave a lecture on Buddhism to the ‘Pure Karma Society,’ which was translated into Chinese." "In Shanghai Mr. Knudsen was preparing, with the help of scholars, translations into Chinese of First Principles of Theosophy, by C. Jinarājadāsa, and The Ancient Wisdom, by Annie Besant." We do not know whether translations were actually carried out as Chinese translations of these books were not to be found. "In Burma, Netherlands East Indies and the Philippine Islands the Society was practically extinguished by the Japanese, as were the Lodges in Shanghai (China), Hong Kong and Singapore." After World War II and the Great Proletarian Cultural Revolution of The Peopleʹs Republic of China taking place from 1966 through 1976, The Theosophical Society ceased existence in China. However, another version of At the Feet of the Master with the Chinese title of Lizugongtinglu (禮足恭聽錄) translated by Mr. Maurice Chu (朱寬) was published in Hong Kong by a private group in 1961 and reprinted in 1972. Up till then, The Theosophical Society was still referred to by the Chinese name given by Dr. Wu – Zhengdaoxuehui (證道學會). This book, together with the aforementioned seven, are the only eight Chinese books kept in the Adyar Library and Research Centre and are believed to be the only ones extant. The Theosophical Society is currently not present in the country with the highest population in the world. As it is verily the mission of the Society to “popularize a knowledge of theosophy”, we must not neglect China, with its population of 1.34 billion people. In this respect, under the auspices of the Indo‐Pacific Federation of the Theosophical Society, a Chinese Project Team was set up in the Singapore Lodge to promote Theosophy to the Chinese‐literate population of the world, primarily in China. To this end, we have developed a dedicated Chinese website www.chinesetheosophy.org as the vehicle for the dissemination of theosophical teachings. Fortunately, China has high computer literacy. Of the population of 1.34 billion, there are an estimated 538 million internet users according to statistics as of 30 June 2012. This is 50% of all users in Asia. The work of the Chinese Project Team consists of on‐going translation of theosophical literature into Chinese which is progressively posted on the website and also facilitating online forums for interactive discussions of theosophical subjects. Work has only just begun. We have uploaded images of the eight Chinese books made available by the Adyar Library and Research Centre to our Chinese website. We expect to accomplish more in time to come. And we have reverted to and shall propagate the Chinese name Zhengdaoxuehui (證道學會) composed by Dr. Wu Ting Fang as the official name for The Theosophical Society thereby preserving his legacy. After all, that name has been recognized as the official Chinese name for The Theosophical Society from 1920 until at least 1972. It is an interesting twist in history that the Chinese Project Team should be established in Singapore, the country of birth of Dr. Wu, to continue his theosophical work in China.